The bright galaxy NGC 3621, captured here using the Wide Field Imager on the 2.2-metre telescope at ESO’s La Silla Observatory in Chile, appears to be a fine example of a classical spiral. But it is in fact rather unusual: it does not have a central bulge and is therefore described as a pure-disc galaxy. NGC 3621 is a spiral galaxy about 22 million light-years away in the constellation of Hydra (The Sea Snake). It is comparatively bright and can be seen well in moderate-sized telescopes. This picture was taken using the Wide Field Imager on the MPG/ESO 2.2-metre telescope at ESO’s La Silla Observatory in Chile. The data were selected from the ESO archive by Joe DePasquale as part of the Hidden Treasures competition . 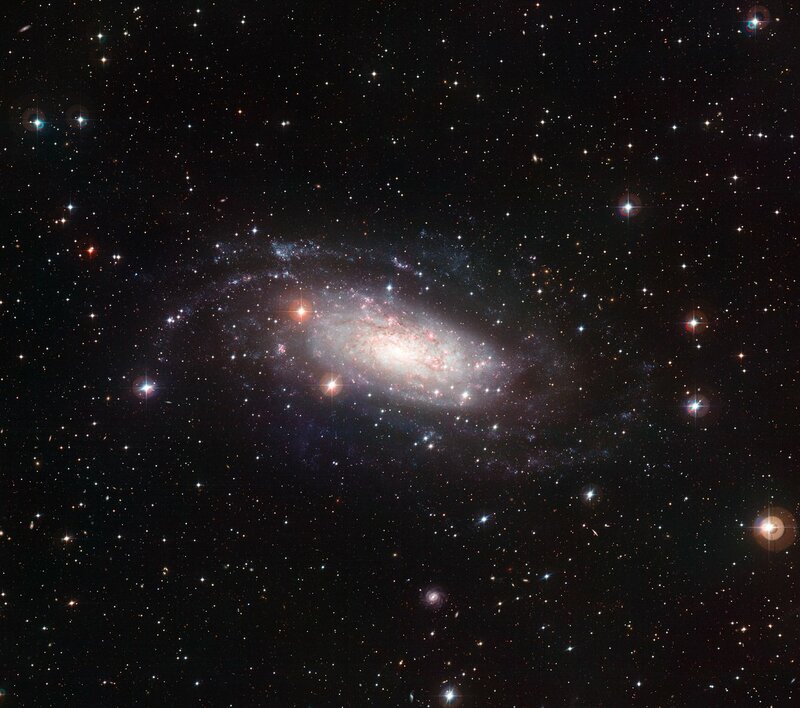 Joe’s picture of NGC 3621 was ranked fifth in the competition. This galaxy has a flat pancake shape, indicating that it hasn’t yet come face to face with another galaxy as such a galactic collision would have disturbed the thin disc of stars, creating a small bulge in its centre. Most astronomers think that galaxies grow by merging with other galaxies, in a process called hierarchical galaxy formation. Over time, this should create large bulges in the centres of spirals. Recent research, however, has suggested that bulgeless, or pure-disc, spiral galaxies like NGC 3621 are actually fairly common. 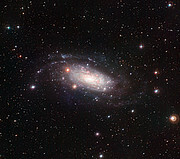 This galaxy is of further interest to astronomers because its relative proximity allows them to study a wide range of astronomical objects within it, including stellar nurseries, dust clouds, and pulsating stars called Cepheid variables, which astronomers use as distance markers in the Universe . In the late 1990s, NGC 3621 was one of 18 galaxies selected for a Key Project of the Hubble Space Telescope: to observe Cepheid variables and measure the rate of expansion of the Universe to a higher accuracy than had been possible before. In the successful project, 69 Cepheid variables were observed in this galaxy alone. Multiple monochrome images taken through four different colour filters were combined to make this picture. Images taken through a blue filter have been coloured blue in the final picture, images through a yellow-green filter are shown as green and images through a red filter as dark orange. In addition images taken through a filter that isolates the glow of hydrogen gas have been coloured red. The total exposure times per filter were 30, 40, 40 and 40 minutes respectively. ESO’s Hidden Treasures 2010 competition gave amateur astronomers the opportunity to search through ESO’s vast archives of astronomical data, hoping to find a well-hidden gem that needed polishing by the entrants. Participants submitted nearly 100 entries and ten skilled people were awarded some extremely attractive prizes, including an all expenses paid trip for the overall winner to ESO’s Very Large Telescope (VLT) on Cerro Paranal, in Chile, the world’s most advanced optical telescope. The ten winners submitted a total of 20 images that were ranked as the highest entries in the competition out of the near 100 images. Cepheid variables are very luminous stars — up to 30 000 times brighter than our Sun — whose brightness varies at regular intervals over several days, weeks or months. The period of this variation in luminosity is related to the star’s true brightness, known as its absolute magnitude. By knowing the absolute magnitude of the star, and measuring how bright it appears, astronomers can easily calculate its distance from Earth. 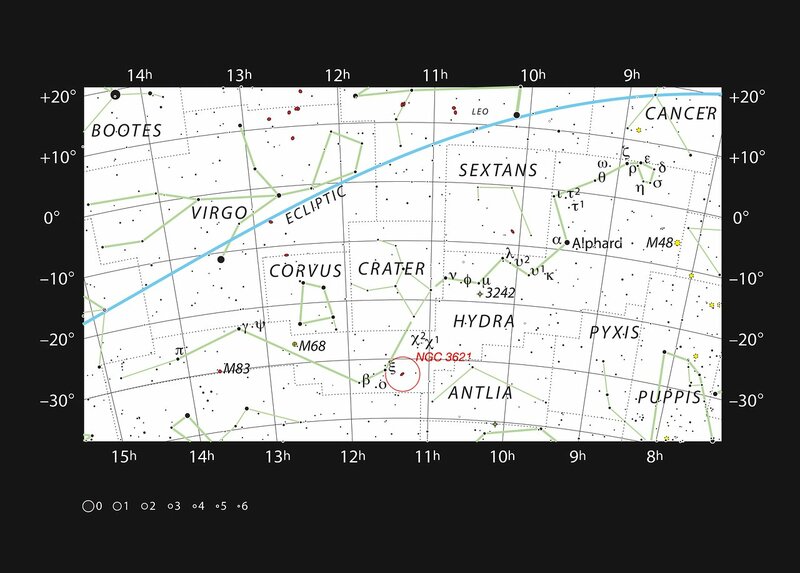 Cepheid variables are therefore vital for establishing the scale of the Universe. ESO, the European Southern Observatory, is the foremost intergovernmental astronomy organisation in Europe and the world’s most productive astronomical observatory. It is supported by 15 countries: Austria, Belgium, Brazil, the Czech Republic, Denmark, France, Finland, Germany, Italy, the Netherlands, Portugal, Spain, Sweden, Switzerland and the United Kingdom. ESO carries out an ambitious programme focused on the design, construction and operation of powerful ground-based observing facilities enabling astronomers to make important scientific discoveries. ESO also plays a leading role in promoting and organising cooperation in astronomical research. ESO operates three unique world-class observing sites in Chile: La Silla, Paranal and Chajnantor. At Paranal, ESO operates the Very Large Telescope, the world’s most advanced visible-light astronomical observatory and VISTA, the world’s largest survey telescope. ESO is the European partner of a revolutionary astronomical telescope ALMA, the largest astronomical project in existence. ESO is currently planning a 42-metre European Extremely Large optical/near-infrared Telescope, the E-ELT, which will become “the world’s biggest eye on the sky”.